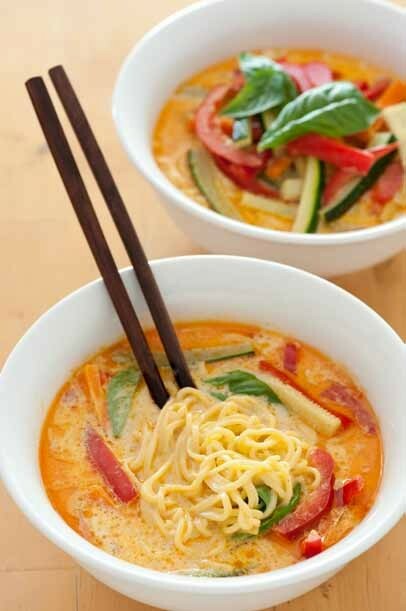 Laksa is a wonderful coconut milk based noodle soup that hails from Malaysia. These days you can get commercial laska or other Thai curry pastes that take all the hard work out of it. I’ve used Singapore noodles in this recipe which are a fine version of fresh hokkien noodles but I have eaten laksa with rice noodles and even a combination of the two so feel free to substitute. I’ ve cheated a little on the 5 ingredient rule by including ‘mixed chopped vegetables’ as a single ingredient. I actually used a carrot, a zucchini and a red pepper, all cut into little batons. Chicken laksa is also really popular. Prawn or shrimps are lovely cooked in the spicy fragrant coconut broth. Meanwhile heat 2 tablespoons of peanut or other vegetable oil in a large saucepan over high heat. Add curry paste and stir fry for 30 seconds. Quickly add coconut cream and 2 cups boiling water. Bring to the boil and add vegetables. Simmer for 2 minutes or until the vegetables are cooked to your liking.